To give the driver a more consistent time to react, the buzzer can alert for faster vehicles from farther away. The bsm main switch is set to on. The shift lever is in r.
Vehicle speed is less than approximately 5 mph (8 km/h). Approaching vehicle speed is between approximately 5 mph (8 km/h) and 18 mph (28 km/h). 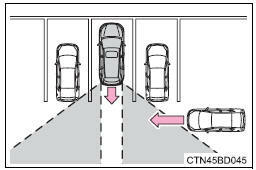 The rear cross traffic alert function is not designed to detect the following types of vehicles and/or objects. when parking on a steep incline, such as hills, a dip in the road etc.